They're armed, dangerous...and downright crazy! Buckle up for an adrenaline-fuelled, action-packed thrill-ride starring Liam Neeson, Bradley Cooper, Quinton "Rampage" Jackson and Sharlto Copley. Convicted by a military court for a crime they didn't commit, a daring team of former special forces soldiers must utilise their unique talents to break out of prison and tackle their toughest mission yet. It's going to take guts, split-second t.. Heroic, daring and more than just a little colorful, The A-Team is a brave band of brothers who will stop at nothing to get the bad guys. 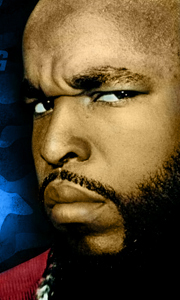 This unforgettable series features Mr. T, one of television's most unique and popular superstars, in his most memorable role. Sent to prison by a military court for a crime they didn't commit, these four commandos escaped from a maximum-security stockade and now survive in the Los Angeles underground ..
All 25 episodes from the third series, featuring the avenging soldiers of fortune out to clear their name of a crime they didn't commit, and help those who need them most. In this series, the A Team help an old army buddy after mobsters threaten his medical practice, travel down to South American to protect a new power station, and tackle a group of bounty hunters sent to capture them. Episodes are: 'Bullets and Bikinis'; 'The Bend in t.. Sent to prison by a military court for a crime they didn't commit, these four commandos escaped from a maximum-security stockade and now survive in the Los Angeles underground as soldiers of fortune. Join B.A, Hannibal, Murdock and Face in all 97 episodes from all 5 seasons of this groudbreaking show, now fully restored and in hi-definition... In this action-packed 22-disc Blu-ray set! Special Features Rumours Of Soldiers Of Fortune: I..
Own The A-Team Seasons 1 to 5 Complete Collection DVD from Deff, DVD, Blu-Ray & 4K Video Specialists - Free UK Delivery..
Everyone's favorite soldiers of fortune return as Season Two of television's greatest adventure series, The A-Team, explodes onto DVD. Pile into that famous black van for another season of adrenaline-pumping adventure with Hannibal, Face, Murdock and B.A. as they fight for justice against dangerous criminals, while staying one step ahead of their archenemy, Colonel Decker. Featuring all 22 thrilling Season Two episodes. If you crave act..
All 23 episodes from the fourth series, featuring the avenging soldiers of fortune out to clear their name of a crime they didn't commit, and help those who need them most. In this series, the team have to rescue a judge's daughter from a gang of mobsters, join forces with Hulk Hogan to stop a youth centre being torn down, and Face (Dirk Benedict) quits the A-Team when he receives a full government pardon, little realising that he's wal..
Be a part of The A-Team's final adventures with all 13 action-packed episodes of Season Five. B.A., Hannibal, Murdock and Face confront their greatest challenges yet when the mysterious General Stockwell joins them to battle bad guys that include hitmen, hijackers, and mercenary monks. Must-see Special Features include an interview with series creator Stephen J. Cannell. All good things must come to an end, but Mr. T and The A-Team live..